Edit: clarified I was not selected to give a speech by emphasizing the "not" and the "proposed." I was not selected to give the commencement speech for my University of Phoenix graduation ceremony. Rather than feeling bad about it, I'll do the next best thing and blog about it! Congratulations to my fellow Bachelor of Science in Information Technology graduates. Greetings fellow graduates, faculty, family, and friends. I have a confession. I came to University of Phoenix (UOPX) already with a job in IT, but I did not know the difference between IT, an Information Technology and IS, an Information System. And technology that includes the OLS (online learning system), lots of PowerPoint, plenty of Word documents, and more email than I want to remember. For myself, I came here to get in, get out, and maybe learn something. I came here so that my former-baby-but-now-inquisitive 3 year-old won't have an excuse not to go to college. I came here to show up my father, who with 20-years of service in the Navy went back and got two degrees and a new career in the time it took me to even sign up for Phoenix. "Get in. Get out. Learn something." That was a simple goal that turned into something much grander because I was surprised by the people. People like our facilitators. Their real-world industry experience surprised me. Where else can you ask 6 working professionals a question like, "so… how do you approach project management? How about that software development life cycle? What do you do when your coworkers annoy you in a corporate environment?" My classmates surprised me. A very few in a bad way (for example, if you're going to copy someone else's work, be sure to change that name in the paper or Java program to match yours before posting it on OLS. But for those of us that struggled and put in the effort and relied on each other, our facilitators, our advisors, and on the occasional YouTube video showing how to write a basic Java program… we've earned it. We'll be a bit more prepared because we put in the time and effort. Let me describe an education involving people, process, and technology. Part of the process was giving yourself permission to do something right for yourself. If you're like me, this degree has been a long time coming. If you're like me, you have your friends and family out there cheering you on. If you've been embarrassed at not having a degree like me, maybe you're here just for yourself. And that's okay. But the shame, hesitation, and guilt for not having a degree is not okay though. To get this far, we had to give ourselves permission to take a chance, to change our habits, to follow all the way through to today. You had nothing to prove, but you now have more skills than you realize. The University of Phoenix education process is all about team-based projects and the constant back and forth feedback in class, on OLS, and between team members. I hope you've learned to love and hate that feedback from your facilitator or from your peers--because it's how we grow. In the absence of hopefully constructive feedback, we won't know what's wrong or right with our writing, our thought processes, or project approach. Feedback improves us as people. You have people, process, and technology skills. You have completed at least 20, 5-week projects covering a range of topics you may never have heard of before. You presented at least dozens of times over a few years on broad and in-depth industry topics, using Word, PowerPoint, OLS over and over again. You can see the hanging-indent APA 6 reference format when you close your eyes at night! In job interviews, when you ask for your next promotion or raise, or when you wonder if this was all worth it, remember your 2 plus years of project experience, immersed in a collaborative environment, working with and against your peers and facilitators. When we get out there with these degrees it will be all about the people. We've done this for ourselves, for our family, to prove something, or because we have nothing to lose and only student loan debt to gain. Embrace the fact that you did this. Diverse people, a tough process, and new technology. Don't doubt and think you can't change the World, you've changed yourselves, and that's a pretty good start. Alvin Reyes restarted his educational career plans with University of Phoenix's Bachelor's of Science in Information Technology (Business Systems Analysis) program in 2009 to learn how to become a "real" Business Analyst. Wanting to finish a degree he started over a decade ago, he hoped to make his family proud and wanted to deny his then infant daughter any excuse to skip college. 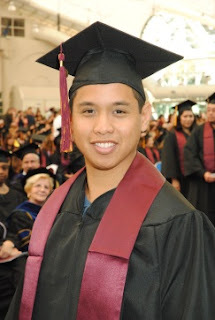 College has rekindled his interest in public speaking, improved his writing skills, and gave him an opportunity to connect with other motivated, working professionals. He has since won a local Toastmasters area speech contest and contributed enough online to be recognized as an "SDL Tridion MVP" by SDL, a leading Web content management software company. He also attributes two promotions and a more comprehensive understanding of project management, information systems, and IT to his experience with the program. He has enjoyed learning from (and challenging) his classmates and the UOPX facilitators. He looks forward to continuing to help others understand projects and technology as he improves his leadership and communication skills. Find him online at http://alvinreyes.net. 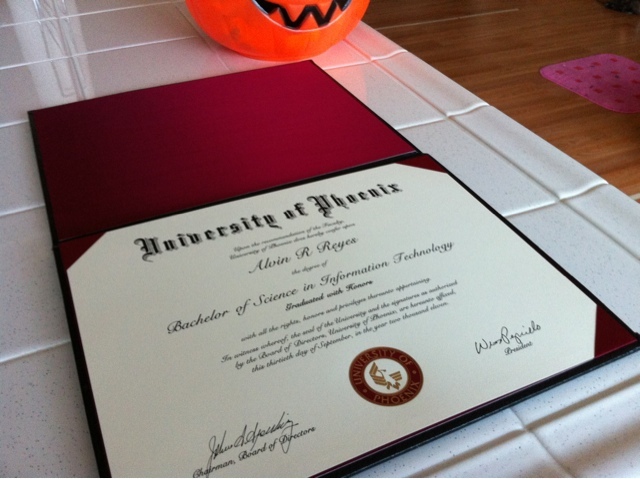 Update: the actual diploma arrived the weekend of Halloween and the graduation images shortly after. Congratulations!! !my dear Alvin....really soooo proud of all your accomplishments professionally and personally... the future holds a real challenge to be of service to others and you are on your way. !!! love a.v. Congrats, well done, nice speech!